"I just had a party. I had a big palette of colors and threw it all at the canvas." Somehow, during the creation of Dream Theater's upcoming album, the invention of an endless series of new music-making apps and preparations for an adventurous orchestral recording with the Symphonic Theater Of Dreams Orchestra in Poland, keyboardist Jordan Rudess managed to sneak another one in there - a collaboration with bassist Tony Levin and drummer Marco Minnemann. "It was one of those situations that's eally appealing to a musician," Rudess says. "There were no limitations. Marco and Tony put down their parts the way they wanted, and then I said, 'OK, guys. Here I am, and I'm gonna do whatever the hell I want with this!'" He laughs, then quickly adds, "But, of course, I had respect and understanding of where they were coming from. You do have to try not to take things too off the track of everybody's interests, even while you're letting your imagination run wild." Perhaps the greatest thing about Levin Minnemann Rudess, the trio's eponymously titled debut album (due Sept. 5th), is that it showcases dazzlingly gifted musicians and technicians who are dedicated to sheer entertainment. The grooves are enormous, the riffs are deliciously rifftastic and the boatload of sounds and textures draw us into a state of sustained rapture. MusicRadar sat down with Rudess recently to talk about how this musical mind-meld came about. So, first things first: the name. Did you guys have to arm wrestle about who came first in the order of things? "The name just rolled out - Levin, Minnemann, Rudess. There was very little thought about the name. We didn't reverse it or try different combinations. Actually, Tony was a producer on the project, so maybe that's how his name came first. He and Marco started it before me - I came in because they needed a keyboardist to complete the music. So I guess the way that it came together dictated the order of the names. I'm pretty easygoing, so I said, 'OK, sounds fine.'" You've played with both Tony and Marco separately, but this is the first time the three of you worked together. How did it happen? "I thought that sounded cool. 'Oh, I'll just go in and do my improvisation thing. I'll mess around and be done in five days.' So I agreed to do it. They sent me the material, I started listening to it, and the first thing I thought was 'Oh, my God, this is not what I thought it was. This is a big album of music.' Some of the stuff was already structured by Marco; he'd pretty much written some tunes, although it was mostly bass and drums, but he does play some guitar. "Although it was wide open, there was still some structure there - a lot of cool rhythms. So this little thing that I was going to throw some jams on and vibe off of became this very serious, progressive, fusion album project for me, which probably took six weeks to do, going to the studio every day and working on. It was like a musical puzzle." "There were these bass and drum parts that were open to me for anything. They would repeat the same note and just jam on it - what does that mean to me? I could go anywhere, any style; I could make it Genesis, I could turn it into Zappa; I could turn it into classical music - you name it. There were a lot of decisions and vibing that went into my role in this." When did you cut the record - before or after the new Dream Theater album? Marco Minnemann playing guitar might surprise a lot of people. "Yeah, I didn't focus on that myself. When I first discovered Marco, when we were doing the Dream Theater auditions, I went and I saw that he had a bunch of solo albums. Then I realized that he does all kinds of stuff. But I let that go and thought of him more as a drummer. It wasn't until this record came up and I looked at some of the stuff that he wrote, and I was like, 'Wow, he's like a big composer, and he's playing guitar, too. This is why I like this guy.' He's a complete musician." Nobody tried to move in on your keyboards, though, did they? "No, nobody did, which was good 'cause I wouldn't have had it [laughs]." Did you approach playing on these tracks differently than you would on a Dream Theater album? "The big difference is that, stylistically, this project, like a Liquid Tension thing, was totally wide open. The whole nature of it was 'What can Jordan Rudess bring to it?' It wasn't so much about 'OK, this is Dream Theater. We have our fairly large window of possibilities.' But you know, if it's outside of that - I don't want to call it a 'box' - but if it's outside of that window of stylistic ideas, then it's just not Dream Theater anymore. "Like when I started with Dream Theater years ago, I brought in so many ideas - more than they wanted to hear. With some things, they'd say to me, 'Yeah, that's really cool, but keep that for your solo album.' [Laughs] Or 'That's amazing… but we don't really play electronic music.' Or else it was, 'Wow, that's the best jazz I ever heard - we're not about that.' But with this, nobody said anything like that. I put all kinds of cool sequency things on it, did some Chick Corea-esque jazz stuff, ran things reverse - I just had a party. I had a big palette of colors and threw it all at the canvas." On the song Mew, I hear some smooth jazz-type sounds that I can't imagine would be on a Dream Theater record. "Yeah, sure. You know, my main gig is Dream Theater, and they don't include that style. But in this case, I was working with musicians who felt a rhythm that was leaning a certain way, so I said, 'Hey, let me call up an electric piano and have some fun!' You know, stylistically, personally, I'm like jello - I'll go in any direction. I like it all, and what I really like is putting it all together." Marcopolis has some old-school prog rock going on. The riff recalls vintage Deep Purple. "Yeah, the main riff is intense. It almost reminds me of Jeff Beck and Jan Hammer. That part, to turn it into that type of thing, was my input, but the bass and drums were already there." The bass in Descend is ultra-low. Do you have to make adjustments to what you play or which programs you use to match up with that tone-wise? 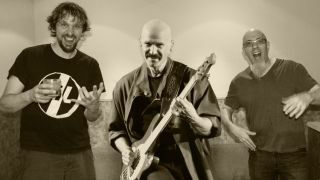 "There's a lot of low tones on that, but it's cool because it's Tony Levin. He hits the bottom, definitely. You know, in my role, I have to let go of my ego. It's funny: Somebody was listening to a Dream Theater song the other day, and they said, 'Yeah, that's great - when do you come in?' I was like, 'What? I'm playing. I'm playing a really heavy sound.' I have a big role with Dream Theater: Sometimes I'm the choir, I'm the brass, I'm the strings - you name it. But a lot of times I'm playing really heavy sounds. "As for this record, I played some pretty low things. There was even one part where Tony played a bass solo, but I'm playing something even below that on the keyboard. I was like a mad scientist on so much of it. I busted out some things like the Continuum; I made some spacey sounds with the SampleWiz on my iPhone and iPad; I processed some things using some interesting IOS sonic tools, putting them into Logic and spinning them around. It's all good fun. I love trying anything and everything and seeing what works." Dream Theater aren't hitting the road until January, so in the meantime, might you, Tony and Marco do some live dates? "Tony kind of said it best: 'We only have one album. It's not even 90 minutes of music.' And you know, in Tony's world, he has so many cool things that he tours with that have those big touring legs, so we're not going to. If this does well, we might do another album, and then, in that case, we could get out there."